God knows what is going to happen with all of this. Is Putin going to destroy the markets and collapse the American economy? Perhaps, and we are hearing more and more of this since the Ukraine became front page news. I do understand however that all the markets are tied together world-wide, so if Putin along with China, purposely destroys the American economy, they will also be hurting themselves. Let's face it, America is a consumer nation, and both Russia and especially China need America to keep on buying. Now, if you tell me it is about the ELITE taking more well then, I can buy that, because that is what happens at war time, the Banksters get richer. Still, it is a time to be cautious, wise and certainly prayerful. -W.E. In 2012 an elite insider claimed that on or around March 4, 2014 the doomsday clock would ring, the effect of which would be a complete collapse of the U.S. economy. How former Vice Presidential adviser Grady Means came to this conclusion with a specific target date may forever remain clouded in secrecy. But given the state of current affairs around the world today, one can’t help but consider that maybe Grady Means was on to something. With the fight over political and resource control in the Ukraine heating up, is it possible the Means was referring to this very set of circumstances? We know the U.S. economy is literally on the brink of a collapse. All we need now is a triggering mechanism. Contrarian investor and commentator Greg Mannarino thinks it could be happening right now, and he explains his highly viable theory in the broadcast below. In essence, Mannarino warns that Russia’s Vladimir Putin may be using the current geo-political climate to position his pieces on the grand chessboard with the end game being a total wipe out of domestic equity markets and the U.S. dollar itself . Given the horrid economic fundamentals in the U.S., mounting and un-serviceable debt levels, and the fact that China is now moving lock-step with their Russian counterparts, could we be seeing the final stages of a coordinated strike on U.S. economic and financial interests? Putin understands the Achilles heel is this hyperinflated stock market… this man is brilliant. Since we realize all warfare is based on deception, this backing off of troops here is a part of the play. When he re-introduces those troops and makes his move here it’s going to crush the U.S. equity markets and take trillions of dollars out of this market and a lot of peoples’ pockets. 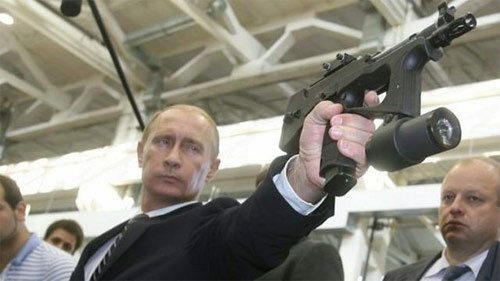 Vladimir Putin is not in any way going to back down to Barack Obama or any of the Western powers. He has no reason to do that. He understands where this going and what he needs to do to make this work here. So this is the set up in my opinion. He’s allowing cash to flow back into the world markets, more specifically into the U.S. equity market. He’s going to re-introduce his troops almost in a Blitzkrieg type fashion and he’s going to destroy the stock markets. We also know this… Vladimir Putin has been betting against the U.S. dollar for years by acquiring gold, just like you should be doing. … The debt of the United States is in the biggest bubble in the history of the world. He knows all this. This relief rally here… I can’t imagine that it’s going to last because he’s going to re-introduce troops here. It’s going to destroy this relief rally and then some. We’re going to get panic selling… I think it can happen pretty soon. Vladimir Putin is pulling a huge bluff on everyone right now allowing equities on a global scale to rise, only to reverse this move and crush equity markets which will destroy the United States economy. The wealth effect that the Fed has created… Vladimir Putin knows that it is nothing more than smoke and mirrors. And he’s going to take advantage of that. Make no mistake. Vladimir Putin strives to make Russia a global super power. China wants the same. In order for that to happen the United States of America must be crushed, and that starts with destroying our economy. And if that means a temporary destruction of global equity markets then that’s what Russia and China will do. Unlike President Obama, who bases his decisions on political surveys and half baked short-term platitudes, these nations operate with stratagems spanning decades. For all we know, it was Putin himself who orchestrated the Ukranian coup. He’s a former KGB operative, a brilliant strategist and he comes from the ‘old school’ of Russian thought. Every move is carefully calculated and executed. While President Obama plays checkers, Putin is executing a Réti Maneuver designed to confuse and frustrate his opponent while leaving multiple pathways for the fait accompli. Perhaps Vladimir Putin will soon give us an answer.